Just when you thought Apple CEO Steve Jobs couldn’t get more badass? 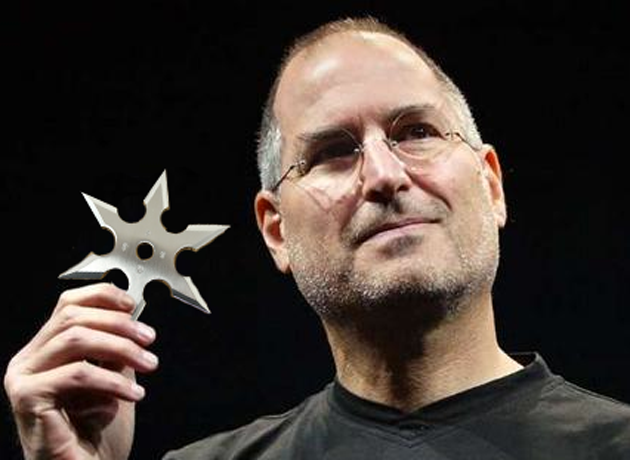 According to SPA!, Bloomberg and about 10,000 nerds on Twitter, Jobs was stopped at the Kansai International Airport near Osaka in July for carrying, yes, ninja stars. According to SPA!, Jobs’ logic in bringing the shuriken (ninja stars) onboard his private plane was that it would be really silly to hijack his own plane. Fair enough. Because of the weaponry fail, Jobs made it clear to airport officials that he wouldn’t be revisiting Japan any time soon, says SPA!. And while Apple declined to comment, Bloomberg, taking the hard hitting lead on this one, actually verified that the incident did happen to somebody (a social media ninja perhaps? ), at the Kansai International Airport and that the aspiring warrior/passenger was forced to throw away the stars. What’s Jobs going to do to top this? Tame a lion? At least he wasn’t caught carrying a lightsaber. Oh well, feel free to include more “Jobs as a ninja” Photoshops in the comments.